What can you do to overcome dissatisfaction with your EHR System? When the federal government implemented its meaningful use initiative as part of the American Recovery and Reinvestment Act of 2009, medical groups finally started to move toward electronic health records en mass. By 2015, nearly 9 in 10 (87%) of office-based physicians had adopted an EHR, and over 3 in 4 (78%) had adopted a certified EHR, according to the Office of the National Coordinator for Health IT. However, the dissatisfaction with EHRs continues to rise at an accelerated pace. It has also resulted in physician burnout which in turn can create more patient safety problems. 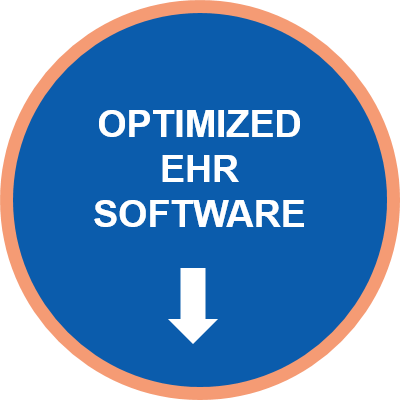 This post addresses the core issue of EHR Optimization and all the facets associated with the process of optimizing an EHR. Your EHR investment should produce results for your small practice—better patient care, increased provider productivity, fewer process redundancies, lower operating costs, and improved revenue cycle management. While small practice EHRs are designed around the unique needs of these groups, there are many steps you can take to optimize policies and processes within your system to make it work to its full potential. Want better results from your EHR? Try these four tips.